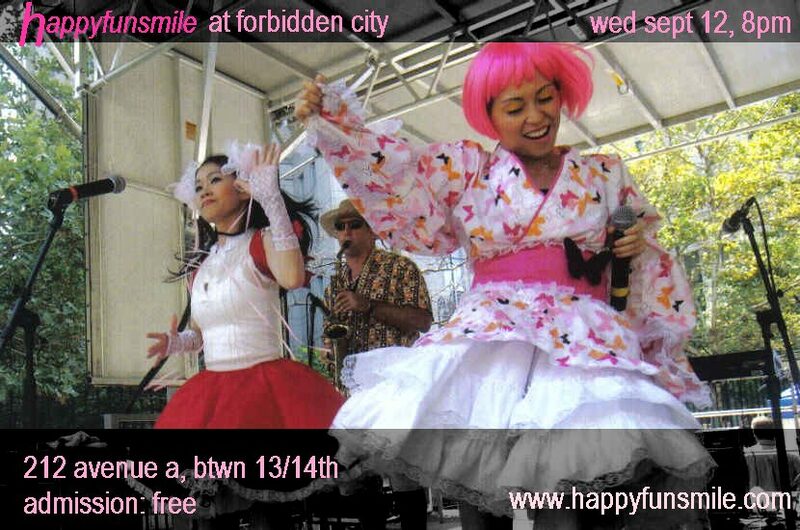 HAPPYFUNSMILE is back at Forbidden City! Did you hear our interview with Nina Thorsen on KQED or WNYC? Well, now’s the time to come hear us live at our favorite bar. We’ve got some old-school Taisho and Showa tunes, two saxophones for your listening pleasure, a whole platoon of singers, and the rest of the gang! HAPPYFUNSMILE will be featured on the San Francisco public radio station KQED (88.5 FM) on Thursday August 23 at 6:30pm and 10pm pacific time. That’s 9:30pm and 1am for us east coasters. Check it out on their radio archive. If you’re an early bird, you can wait until this Sunday August 26, when it will be broadcast on WNYC at 6am. 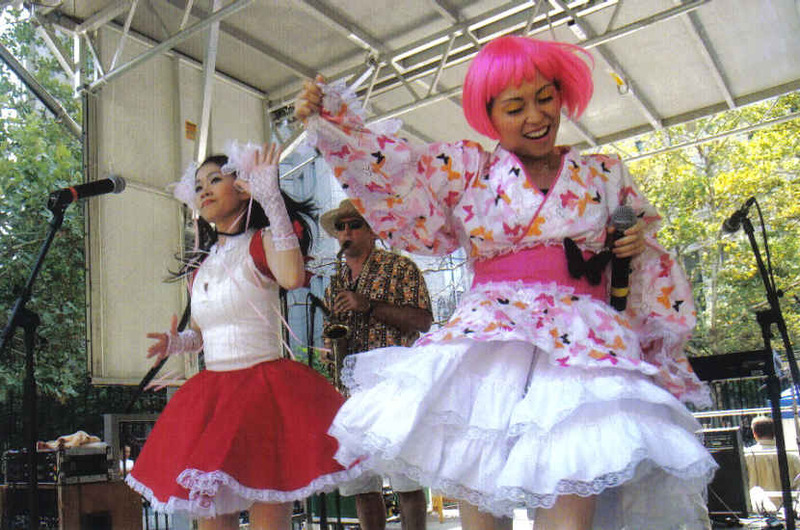 Thanks to the radio show Pacific Time and Nina Thorsen, who interviewed us at Soundfest and danced along to all the bon-odori tunes carrying all her audio equipment! That’s her in the blue dress! KIOKU begins its artist residency at the Issue Project Room on Wednesday 9/19 with two full sets starting at 8pm. This event also heralds the arrival of our debut CD, Both Far and Near, on Quiet Design Records. You can purchase copies at CD Baby or pick them up at the show. In the months to follow, KIOKU will be hosting and collaborating with some of New York’s most exciting and respected musicians, including cellist Daniel Levin, saxophonist Rob Brown, violinist Jason Kao Hwang, kayagum and ajang player Sang Won Park, and drummer Tatsuya Nakatani. 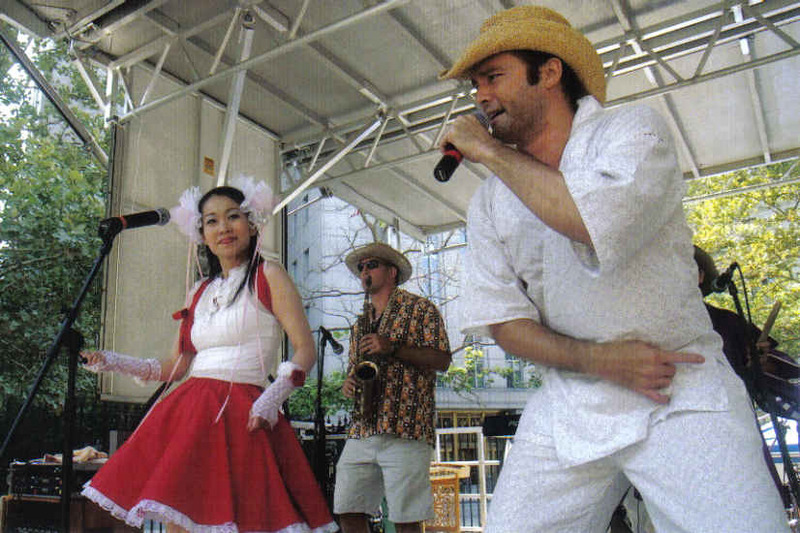 HAPPYFUNSMILE is proud to be a part of Soundfest, an Asian American music festival to be held in NYC’s Chinatown! We’ll be sharing the stage with a host of amazing performers including Falu, Slanty Eyed Mama, and Rudresh Mahanthappa. Be sure to check this one out, but be forewarned. Each group gets a 15-minute slot, so don’t be late! KIOKU finished up the California tour on Monday night and it was quite a whirlwind of activity. I’ll try to sum up in brief all the highlights and the one lowlight. We met up in Sacramento, where we stayed at the two-house compound of the Sakkal family. Not only was their great Middle Eastern food, a place for us to rehearse, a pool table, and six thousand channels of cable tv, but also a bunch of cool bull mastifs and pups! We had great sushi at Mikuni and an awesome BBQ, prepared mostly by Ali, with hummus by Mom Sakkal. On our way out of Sacramento, I stopped by this store called Reflections of Asia and purchased a kulintang set! Strangely enough, this guy lived only ten minutes away from the Sakkals. Our first gig was at the Edgetone Summit in San Francisco, where we shared the stage with some amazing musicians including Liz Allbee, Tatsuya Nakatani, Rent Romus, and Jim Ryan’s trio. The venue was great and the people were all very friendly. After the show, we hung out with Ali’s friend and made a late-night excursion for Mission burritos. That night, we stayed at this crazy mansion up in Twin Peaks, complete with an actual R2D2 from the Star Wars trilogy. Quick drive down to San Jose where we met up with my Mom, who was visiting the Bay Area from Hawaii. The Works/San Jose venue is in a new location with lots of square feet, high ceilings, and cavernous acoustics. The people were awesome, Steve Cooley was an exceptional host, and Mom and Dad Yamami and Dad Sakkal were in attendance. We met Polly Moller and this really cool DJ named Dajis. Here’s a video from the evening. Driving to Stockton wasn’t too bad and we had a fun time at Blackwater Cafe. Thanks to John Vaughn for bringing us to the Yosemite Sound Festival and to the members of Stockton Taiko for coming out to the show! After the initial flurry, we took a breather and went camping in Big Sur, where we roasted marsmallows and hot dogs and ate Trader Joe’s indian food. Hiking during the day and poker and beer at night. Unshowered and hungry, we made our way to Monterey and Mr. Sakkal’s apartment. Just as we arrived, Mr. Sakkal called and told us he had hit a car. We helped him deal with the police and the insurance company, then made our way to the mechanic. As we stood in the parking lot, Ali and his friend Sam, rescued a dog and we all helped a woman with her nonfunctioning car. Afternoon by now, we were still unshowered and hungry, so we headed back to Papa Sakkal’s place for some awesome home-cooked food. Water was out, so we met up with some of Chris’s friends in downtown Monterey, checked out the new Monterey jazz venue, and headed home to finally shower. We drove down to LA and played our next gig at Dangerous Curve, this art space not far from Little Tokyo. The acoustics were warm and wet, but not too much so, and in fact it was probably the best space for us during the whole tour. Jody Redhage, a cellist from Brooklyn, opened the show and we performed afterwards, with Bryan and Chiemi Yamami and the Ariza family in attendance. By now, you can see why we called it our Family Values tour. Bryan and I visited a few music stores and I purchased a Korean jing from Bill Yoon at Koreana Gifts. Our only lowlight came in San Diego. We drove down in the early afternoon to catch the San Diego Obon Festival. While Ali took a nap in the car, Chris and I hung out, saw a performance by Asayake Taiko and San Diego Taiko, and purchased a tea set for the Ariza family. Upon arriving at Vinbladh’s, we were skeptical due to its incredibly cramped stage area, which looked just like someone’s living room. They mentioned noise restrictions and after our soundcheck, told us we’d have to play much quieter. If it weren’t for our friends and family coming to the show, we would have cancelled, but we decided to do a brief and ultra-quiet set. Meanwhile, the gypsy music was coming in from a restaurant across the street, so we were more than a bit puzzled by the noise restriction. Ali hung with his girlfriend Kim and her family afterwards and Chris and I headed over to my friend Kathy’s place, a crazy compound with a pool, jacuzzi, multi-levels in the backyard, and the biggest flat screen and movie screen I’ve ever seen in a house. With the awful Vinbladh taste in our mouth, we were happy to come back to LA and our final gig at 2nd Street in Little Tokyo. Everyone was great, especially Gary Tsujimoto and the owner. We had a big crowd with tons of friends and Bryan’s adult taiko group, Bombu Taiko, in attendance. Afterwards, we headed back to Bryan and Chiemi’s house for some chicken wings and beer. I learned quite a bit from being on the road with Ali and Chris, but most importantly, we realized that we could spend fourteen days together without any major problems. It was great seeing old high-school and college friends and the tour wouldn’t have been nearly as comfortable without the help of our family. Additionally, I was able to see Traci in Orange County and finally met her father. My HAPPYFUNSMILE experienced paid off, as I played “Kimi to itsu made mo” on the piano as he sang. Traci also met my parents at the Higashi Hongwangi Obon Festival and made plans to meet up in Hawaii. Finally, while on tour, we negotiated the dates for our residency at Issue Project Room, so we’ll be back to work very soon. 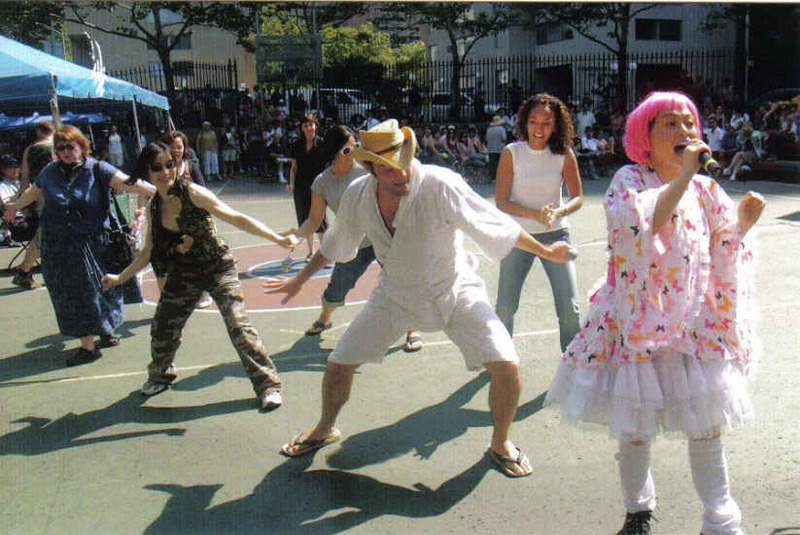 You are currently browsing the wynn yamami blog archives for August, 2007.